Curious at how your nonprofit organization stands up against the rest when it comes to online messaging, fundraising and social media? Thankfully M+R Strategic Services and the Nonprofit Technology Network have analyzed 44 nonprofit data sets to analyze the average performance in 2011, measuring email messaging, list size, fundraising, advocacy, social media and mobile programs. The results were compiled into the 2012 eNonprofit Benchmarks Study. However, we realize that many of you are way too busy to sit down and analyze graph after graph or even understand the significance of the findings. Here at Guest Relations Marketing we have interpreted the data for you. Over the next few days we will roll out important takeaways from the study and explain what is means for nonprofit organizations. Today, we discuss email messaging! When sending emails, advocacy messages had the highest open rates, click-through rates and response rates – as well as the lowest unsubscribe rates. In contrast, fundraising emails have the lowest open rates and highest unsubscribe rates. On average people don’t enjoy being asked for money, even if they are a Zealot for your organization’s cause. Keep this in mind and consider providing fundraising news within other email messaging. Want to put a heavy emphasis on the fundraiser? Then be sure to use a crafty subject and headline that will capture the recipient’s attention. Directly stating that your email is requesting they contribute could send their cursors directly to the delete button. 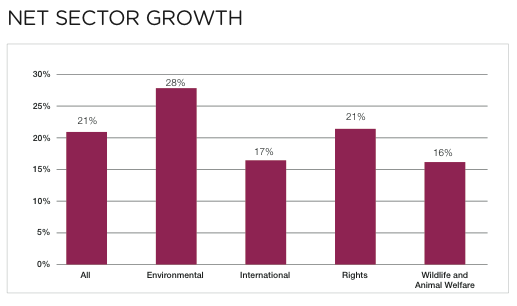 With only a few exceptions, almost every organization in the study saw their email subscriber list grow from 2010 to 2011, though the increase in growth rate appears to be slowing (environmental groups grew their lists at the highest rates). Remember that every day people’s inboxes are flooded with random emails that most consider spam. It’s easy for an individual to get frustrated at the constant stream and quickly hit the unsubscribe button. More relevant to this topic, it is easy to assume that many people are hesitant to even sign up for email newsletters out of fear of how their inbox will be filled. Finding a solution to this problem on the surface is two-fold. First, whatever the cause that your organization is working for, it is important to make it relevant and trendy to the general public. Environmental concerns has been a general growing topic of interest over the last few years and it can be assumed that this would have a direct correlation to the large increase in email subscribers. Second, you must provide incentive for people to want to receive emails from your organization. Maybe this is subscriber only updates, or behind the scenes looks. Whatever the news, make it clear for people that the only way they will get certain information is by signing up for your email newsletters. 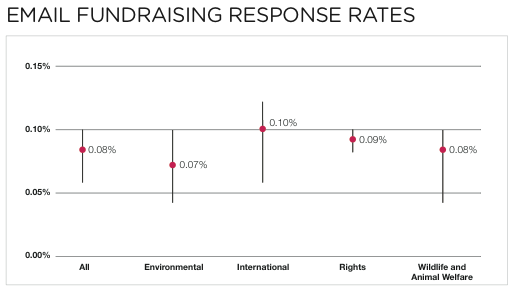 Between 2010 and 2011, the email fundraising response rate held steady at 0.08%, with a negligible growth of 2%. Online fundraising has steadily increased in popularity for nonprofit organizations. This should not be news to you. However, what is important to take note of is that email fundraising rates are generally low and should not be the only way your organization pushes to raise money. Interested in what other methods generally show success at fundraising? Then tune into our post tomorrow where we will highlight some of the study’s findings of online fundraising. « Marketing, Metrics and Measurement, Oh My!